Heimtextil, to be held at Frankfurt from 9 to 12 in January, 2018, exhibits the main trends in interior design and textile innovation, revealing the patterns, colors and textures of future seasons. In this edition, under the premise “The Future is Urban”, the urbanization of societies will be at the heart of the event, exploring in which ways said change can affect the links between human beings and the objects they use. 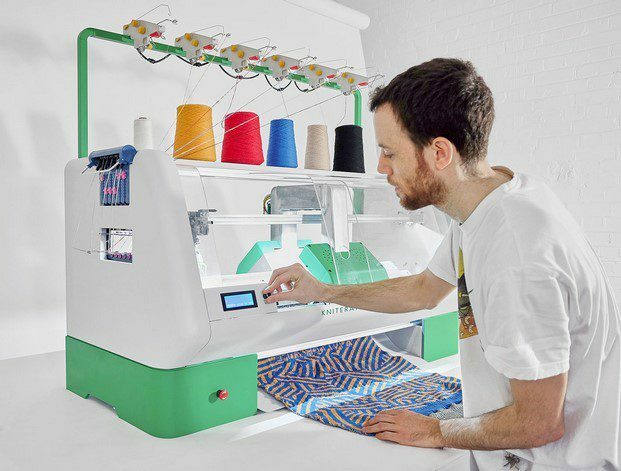 As one of the distinguished projects within the trend “The Maker Space”, Kniterate uses thread to print the clothing piece the user selects, always taking digital patterns of easy use as a starting point, and being able to make from scarves and hats to jerseys. For a fraction of the space and the budget of similar machineries, Kniterate proposes an accessible solution for small fashion entrepreneurships, design studios and universities, while using an open platform for the users to generate a design community and share their creations. Heimtextil, with almost 3 thousand exhibitors, is a gathering that cannot be missed by designers, interior designers, decorators and architects, that also highlights the trends “The Flexible Space”, “The Healty Space” y “The Re-Made Space” as definitive within the industry.